About us Johor Bahru JB Malaysia , Hong Yi Holidays Sdn. Bhd. Hong Yi Holidays Sdn Bhd was established on 13th November, 1996 and currently located in, No. 117 Jalan Baiduri , Taman Daiman Jaya, 81900 Kota Tinggi Johor, Malaysia. We have a fleet of 11 coaches and still growing, a total work force of 20 peoples with affiliations. 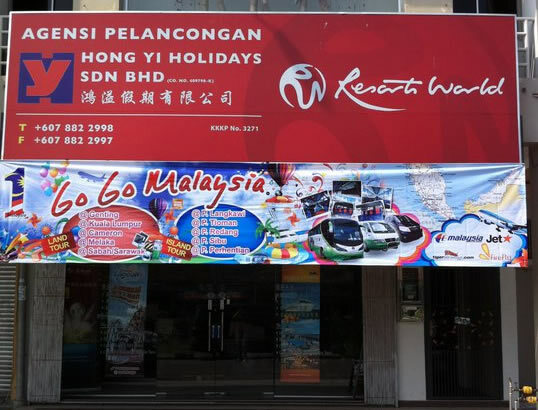 Hong Yi Holidays is also an active member of the Malaysia Association of Tour and Travel Agents (MATTA), Genting Highland appointed agent at Kota Tinggi. Our Hong Yi fleet of tour buses allowing us to handle large size of tourist arrival into Penninsular Malaysia, continue to Singapore and Thailand. We provides buses, vans, MPV transportation services for tours - Meeting - Conventions - Sports - Gathering - Exhibitions events organizers. 鸿溢假期有限公司成立于 1996 年 11 月 13 日，位置于No 117 Jalan Baiduri , Taman Daiman Jaya, 哥打丁宜. 目前我们的车队由11辆游览车组成,数目尚在与日俱增当中,全体员工拥有20余人. 鸿溢假期是�R�砦��旅游同�I�f��(MATTA)的活动会员,同时也是云顶集团哥打丁宜区的指定代理.